The Heidelberg Catechism was first published in a German territory called the Palatinate on January 19, 1563- 450 years ago today. It was written in order to instruct people in the basic truths of salvation in Jesus Christ. Since then, the Heidelberg Catechism has been used in many churches, and is still used as a teaching tool in many churches today. The word catechism is really just another term for teaching. So, not surprisingly, from the time it was first publishing the Heidelberg Catechism has been used for educational purposes. Lets look at how the Catechism is used in many churches today. The teacher is usually the pastor of the local congregation. Not only should he be familiar with the content of the Catechism, but he should be sufficiently well-versed in Scripture that he can demonstrate to the students how the Catechism summarizes the Bible and how it helps people understand God’s Word. If a pastor is not available to teach catechism classes, an elder in the church, or someone else who is gifted at teaching may also do it. The students are, in the first place, the youth of the church. Different churches begin catechism instruction at different ages, but it is common to begin with 12 or 13 year-olds. Typicaly, catechism instruction then continues until the students are 17 or 18 years old. The teenage years are in many ways an optimal time to give the kind of spiritual instruction provided by the Catechism. It is a formative time in life when the youth are beginning to ask many doctrinal and personal questions about their faith. Through catechism instruction, they receive the answers they are looking for in a systematic and fairly comprehensive way. Having five or six years of catechism instruction gives enough time to lay foundations in the earlier years and build upon that as the students mature. The Catechism can also be used to teach younger pre-teen children. This teaching can be done by a pastor, but parents or other teachers can do it as well. For the younger students, a shorter version of the Catechism, called the Compendium has been used as an introduction to the complete Catechism. You can download a copy of the Compendium here. Another situation in which the Catechism has been used very successfully is in introducing new converts, both younger and older, to the joy of salvation in Jesus Christ. Those who have not grown up in the Christian faith often feel overwhelmed by how there is to learn about the Bible. The Catechism does a masterful job of explaining the highlights, step-by-step, in accessible language. The fact that the Catechism is divided into fifty-two Lord’s Days already indicates that it is not only used in a classroom setting, but also in the worship services. Indeed, from the time it was first published, the intention was that pastor would use the Catechism in their preaching, most often in the second (afternoon or evening) worship service on the Lord’s Day. Ideally, the entire Catechism could be covered in the span of one year: 52 Lord’s Days in 52 weeks. Practically speaking, it’s challenging for pastors to complete the Catechism within a year. Vacations and other special events usually extend the course of Catechism preaching by several months more than a year. Time considerations aside, though, the practice of Catechism preaching has a number of notable strengths. First of all, it requires a preacher to work through all the major aspects of Christian doctrine and life. There is no steering around the uncomfortable issue of sin because LD 2-4 deal with it extensively. Lifestyle issues such as language (LD 36), family (LD 39), sexuality (LD 41) and prayer (LD 45-52) are all there. Secondly, it allows the preacher to pull together various Scripture passages on one topic. Preaching that really digs deeply into one particular passage, often called expository preaching, is excellent. However, there is also a need for preaching which shows how various Scripture passages fit together and reveal, for example, God’s plan for believers after this life. Preaching on LD 22 allows a pastor to do just that. Thirdly, the Lord Jesus went throughout Galilee preaching and teaching (Matt 4:23; 11:1). The two are inseparable, but they are also discernible. Preaching calls people to faith in Christ and exhorts them to live a life worthy of the calling to which they have been called (Eph 4:1). Teaching focuses more on helping people grow in the knowledge of salvation and providing them with practical instruction on how to bear fruit in every good work (Col 1:10). To be sure, there is overlap between preaching and teaching. Yet Catechism preaching, with its pedagogical approach of building one doctrine upon another, maintains a healthy component of teaching in the preaching. One concern that has been expressed about catechism preaching is that it leads to preaching the words of men rather than the Word of God. However, as the extensive lists of prooftexts for each Lord’s Day demonstrate, the primary purpose of the Catechism is to lead people deeper into God’s Word, and certainly not to draw any attention away from it. Large collections of catechism sermons exist. Websites, like this one, provide large, searchable resources. The Catechism is written in a warm, personal and devotional style. It can readily serve as a guide in personal morning or evening devotions. Following the prooftexts can lead you to meditate on the passages of Scripture linked to that particular Lord’s Day. Bible study groups can also follow the Catechism on a weekly basis, making profitable use of teaching outlines or other resources on this website to guide and enhance their discussions. 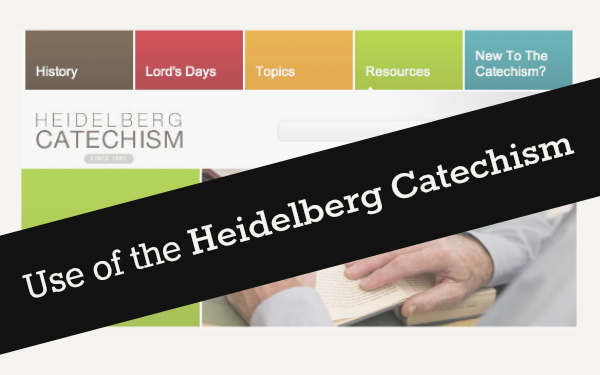 Find more about the Heidelberg Catechism here, along with countless test, audio and video resources!